Tribute tea or Gong Cha was consumed by Chinese emperors. It has a huge influence on the course of Chinese tea history. Many famous Chinese teas were offered to Chinese emperors as tribute. The history of Gong Cha went back a long way. According to chronicle Hua Yang Guo Zhi, written by Chang Qu at around fourth century, people in the ancient Bashu states offered tea as tribute to the Emperor at around 1,000 B.C.. It was voluntary at first, then compulsory. A central system was introduced in 700 A.D. of the Tang Dynasty that was to change the face of Chinese tea history forever. Officials were dispatched throughout the Kingdom to supervise the collection of tea. Stringent high standard was imposed, effectively acting as another tax burden. Tribute green tea was picked and roasted in the same day. One kilogram of green tea can have as many as 180,000 tea shoots. An imperial tea farm could employ tens of thousands of tea workers at peak season. No longer just a medicinal tonic, Chinese green tea became an integral part of aristocrats’ everyday life. Well educated and appreciative, these imperial tea connoisseurs were at the cutting edge. 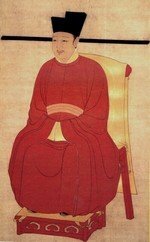 Emperor Song Hui Zong (1101 to 1125 A.D.), perhaps the most tea-crazy of all emperors, was the most eminent tea drinker of his generation. Throughout more than 1,000 years of the Gong Cha system, tea makers innovated rapidly to keep up with the shifting taste of the imperial court. Chinese green tea progressed from tea cake, to loose green tea in all its stunning varieties, then to white tea, yellow tea and oolong tea. Today, many Chinese gourmet green teas were ex-tribute. They dominate the tea export market, rewarding local tea growers with lucrative foreign dollars. It is finally payback time for the growers and makers themselves. Chen Zhong Xian (1992). Zhongguo Chajing. Shanghai Wenhua Chubanshe. White tea history goes back a long way, but modern white tea didn't exist until late 19th century. Oolong tea history goes back at least 500 years. There are 3 widely quoted theories on how it started to exist.